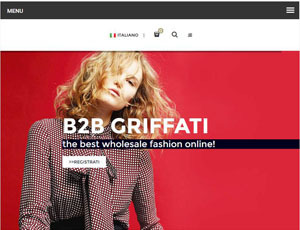 ﻿B2B.GRIFFATI.IT is one of the largest international wholesale fashion companies in the world. B2B GRIFFATI's company was founded in 2013 by the intention to build an e-commerce directed only at wholesalers. In just three years, B2B GRIFFATI has successfully acquired our place in the European scene. B2B GRIFFATI's Italian roots put style and quality at the heart of our concept. On B2B GRIFFATI you can find more than 20,000 items of designer clothing for men and women. The customer is at the centre of B2B GRIFFATI's unique business model, which includes wholesale, different kinds of drop ship services and delivery. B2B GRIFFATI's international desk is at your disposal to give you information and to support you. About B2B.Griffati.it - International wholesale fashion companies in the world's recommend,only on behalf of the views and opinions about B2B Directory, if you have any suggestions , please feel free to contact with us, we will amend and correct them in the first time according your suggestions. More better B2B Websites recomend, Please click here.